I've loved to read for as long as I can remember and so I am glad that Blake loves books as much as I do. I've made sure that we have read to Blake since he was a new born as I feel reading is so important for learning. It's an activity that we both do together, Blake loves looking at the pictures as I read to him and he also loves to sit and look through books at the pictures by himself. 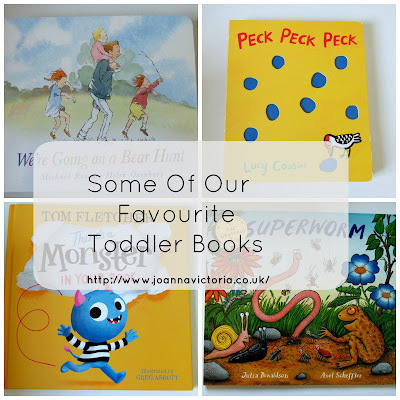 So today I wanted to share with you some of Blake's favourite toddler books. We own a lot of Julia Donaldson books and so I have only chosen to include a few of our favourites there are many more that he loves too. What are your child's favourite book/s? Lovely selection of books. We are huge Julia Donaldson fans too and especially love The Gruffalo. My son also loves the book Guess How Much I Love You. We absolutely love Superworm in this house! We now look for bugs in the garden and the boys get so excited when we are gardening and dig up a big worm. They even make a point of waiting until they dig themselves back into the soil to stop birds eating them. You have some wonderful pick on this list lovely! A couple of favourites too! we LOVE superworm, my sons pet name is 'wormy' and it was a no brainer haha! Fab post! We love books and some of these are our faves but we haven't read them all! There's some great tips here to get toddlers learning really early.